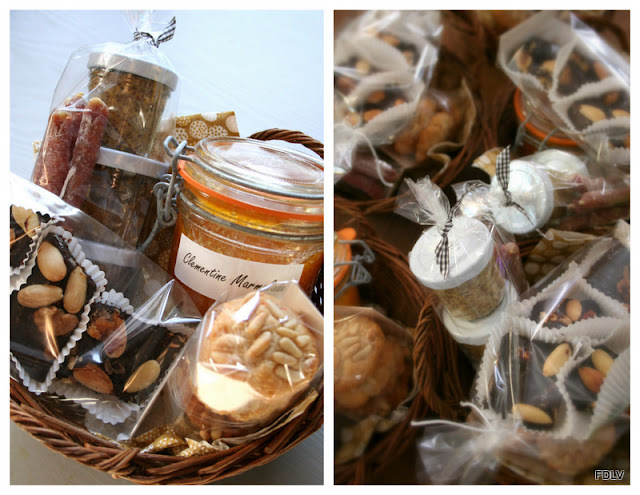 Sticking with the philosophy of handmade or vintage gift-giving this season, I enjoyed creating 'petits paniers' of holiday treats for my French family this year. It took about a week of planning and creating in the kitchen and taking the leap into attempting some new things that I had never tried before (ie-candy making--le nougat chocolat)... but I have to say that this effort was so much fun for me and despite the time it took, spending that time in my tiny kitchen the days leading up to Christmas, listening to Christmas carols and chasing out the voluntary 'samplers' that were hoovering in the doorway--really instilled a joyful and happy holiday spirit in our home. Here is how it turned out. I made three flavors of whole grain mustard which were packaged with market-made fresh 'sauscisson' sticks, Italian 'Pignoli' cookies--chewy delicious (and as a bonus; gluten and dairy free!) 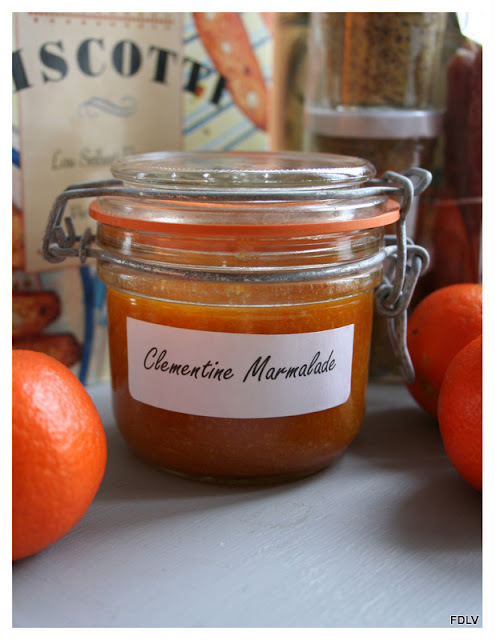 Clementine Marmalade--sweet, subtly bitter, sunshine in a jar, and of course the decadent and rich 'Nougat Chocolat' which I have previously posted the recipe. 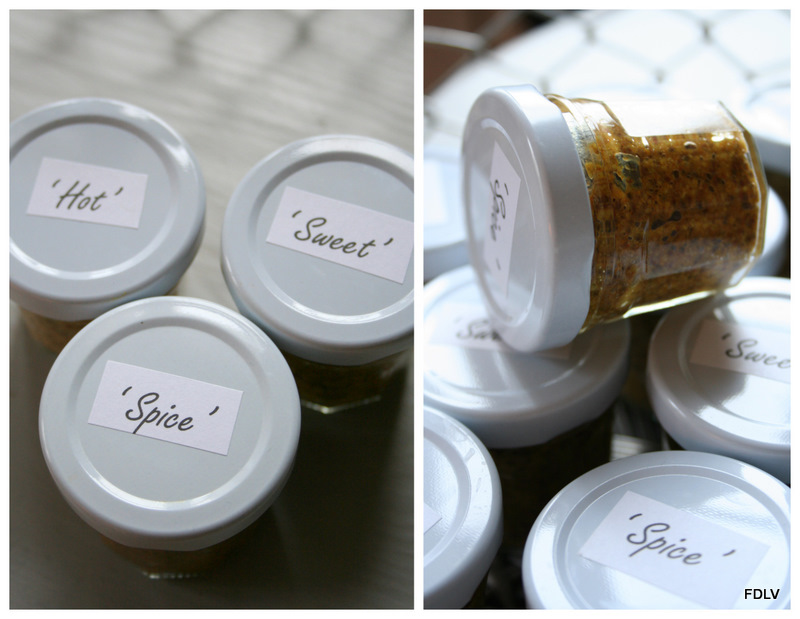 Recipes for the other items will follow shortly. I think you are probably not in a rush to have the 'how-to's , if you are like me--maybe you are a tiny bit tired of cooking and baking.... for now.... or at least until next year. I hope you had an absolutely delicious Christmas! Our family had a big dinner on Christmas Eve--my brother-in-law who is a chef--made a fabulous multi-course meal; smoked salmon and shrimp, pâté de foie de canard, Chapon with roasted vegetables..... Oh, I feel full again just writing about it! Continue to enjoy the holidays mes amis! Bon appetit!